Austria is great for walking, whether it is a steady walk along the valley bottom, or something more strenuous at a higher level, you will not be disappointed when it comes to the views? Are known for the varied terrain. Walkers are able to experience an assorted range of natural topography - sometimes all in one day! mountains, forests, lakes, valleys. Walks to consider Around the Lake at Zell am See? For those who like there walks on the level, i would recommend the lakeside ramble around the waters of the Zell am See, it comes in at around 7 miles, at just over two hours steady walking and is predominately flat, with interesting vistas across the lake. There are places to stop and have a swim and have a drink. I would recommend the Grand Hotel in Zell, the prices are not too expensive and it is well worth a visit to take in the ambience. 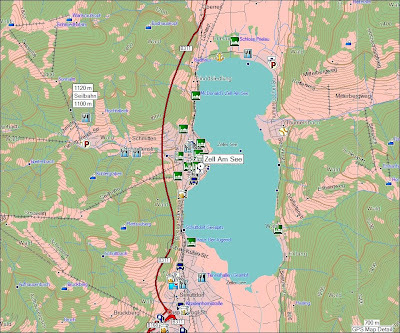 To find the route click on the link and have a play with the terrain buttons? the walk up the valley to the Schmitten ski lift is entirely an optional extra loop. If you do the walk in winter you may have the further option of walking across the frozen lake to or from the Thumersbach. The lake does not freeze every winter, but when it does it is more likely to be in the middle / end of February. You can take the cable car up the 2000 metre high Schmitten, it is a little bit cheaper in the afternoon for those who are on a budget. There is a cafe / restaurant and the Empress Elizabeth chapel which is worth a peek inside. The route down the mountain is easy to find and follow and can be found on the attached map again have a play with the buttons to get the most from the map, there is a shorter route down to the Schmitten chair lift base, which is served by a large car park and bus service. For those who take this shorter route your walk can take you past a swimming pond just up from the Schmitten on the south facing slope, there is also a bar, which is certainly welcome on a warm day. For those who miss the turn for the natural swimming pond (alibi man made), you also have the option of a swim in the drinking water quality lake of the Zell am See ( sometimes called the Zell am Zee). The walk from the top of the Schmitten down to the base of the lift at a steady pace takes around 2 and a half hours. Another walk is up the top end of the Sallbach / Hinterglemm valley, it follows the contours of the mountain, going higher as the walk progresses from a start of around 1200 metres up to around 1500 metres, into the higher alpine meadows, look out for the flowers beneath your feet as you take in the views! Again have a look at the map, and click on the options which suit your needs. During the winter months, paths are kept clear to encourage walkers, to get out and enjoy the scenery. On the top of the Schmitten a footpath at high level follows the line of the ridge, down from the highest point. Further down the valley at the cable car station there are further forest paths which are kept clear again for walkers. Across the valley there are walks from the top of the Maisikogel chair lift above Kaprun, with mountain restaurants to stop off and to take in a hot chocolate. Nordic walking along the lower slopes and a along the valley bottom are further possibilities. 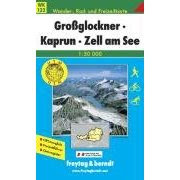 To get maps of the region, to find that particular path or cycle track, they are readily sold in and around the area at a reasonable price but they can also be purchased in advance through Amazon. it sleeps 3 - 9 people in comfort, and is only a short walk away, from the start of the extensive footpath network, from the centre of Kaprun or to the bus stop or mountain cable car.